Fish that are released into public waters are raised at two of New Jersey's state fish hatcheries. These include the Pequest Trout Hatchery and the Charles O. Hayford hatchery in Hackettstown, also known as the Hackettstown Fish Hatchery. 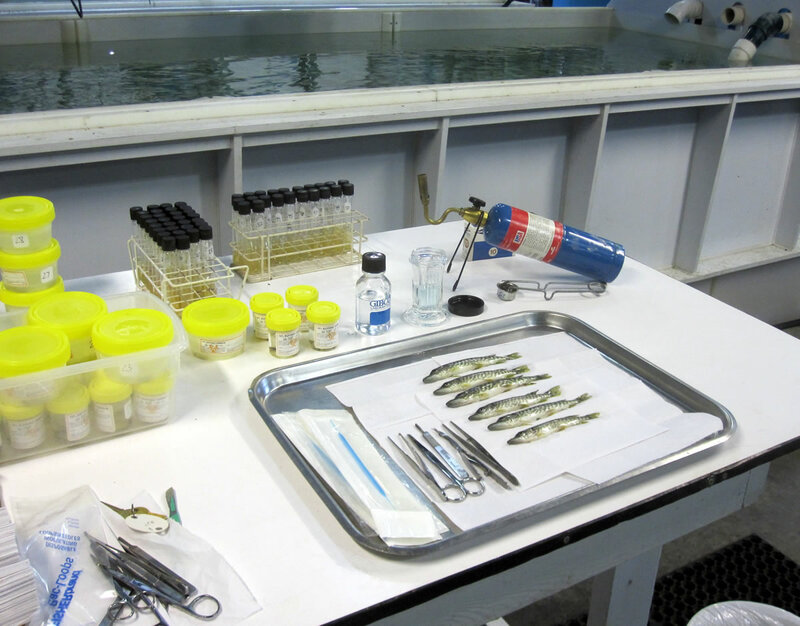 To ensure the health of our hatchery fish and in order to limit the spread of diseases to wild fish, annual fish health inspections are completed prior to stocking these fish into the wild. The inspections include testing for known problematic viruses, bacteria, and parasites. In addition to annual health inspections, any mortality events that occur within the hatcheries are investigated to determine the cause of death and to propose management strategies to avoid diseases. Following a bacterial disease outbreak (furunculosis) at Pequest in 2013, staff have made efforts to enhance the biosecurity of the hatchery to better avoid disease problems in the future. As part of this effort, a Blue Ribbon Panel on Hatchery Biosecurity was assembled to review and recommend improvements to the hatchery. Click on the link below to view the recommended improvements. The Pequest Trout Hatchery raises three trout species for stocking within the state. Infectious diseases are limited at this hatchery because broodstock are hatched and raised on site and the hatchery utilizes flow-through raceways (long rectangular tanks) fed with natural well water. 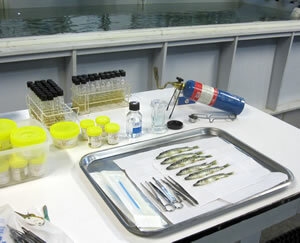 Annual health inspections ensure that healthy fish are stocked into the wild. In the fall of 2013 the bacterial disease, Furunculosis, was found for the first time at Pequest. It was believed to have been introduced by a bird, most likely feeding on an infected fish in the wild and transferring the bacterium to the hatchery raceway. It caused disease in brook and brown trout, while rainbow trout were relatively resistant to the disease. The outbreak of Furunculosis led to modifications in the 2014 trout stocking program to ensure conservation of the state's trout fishery. The Hackettstown Fish Hatchery is a unique facility that utilizes ponds, recirculation systems, and flow-through tanks to produce approximately 15 different fish species for enhancement stocking in state waters. With the variety of fish species being raised in a number of culture methods, there are great opportunities to research the biology and health of these fish. Generally, adult broodstock fish are captured from the wild and young fish are grown out in open pond systems, providing great opportunities to learn about infectious agents that may be present in wild hatchery-reared fish. Through routine health monitoring we can be sure that we are releasing healthy fish throughout the freshwater environments in the state. Northern pike are euthanized and prepared for tissue collection as part Hackettstown's annual fish health inspection to ensure they are free of the major infectious agents.